The Los Angeles City Council’s Planning and Land Use Management Committee (PLUM) has voted to landmark only the most historic elements of the Los Angeles Times complex, paving the way for the demolition of a William L. Pereira–designed addition from 1970. The decision to deny Historic-Cultural Monument (HCM) status for the entire complex comes as developer Onni Group and architects AC Martin push forward on a transformative project that aims to bring two high-rise apartment towers containing over 1,200 units to the portion of the LA Times complex site currently occupied by the Pereira-designed structure. Preservationists Kim Cooper, Alan Hess, and Richard Schave had been fighting to designate the entirety of the complex in an effort that predated the 2016 announcement of the AC Martin–designed project. The approach was geared toward positioning the Late Modern addition as an integral portion of the complex and as a pivotal structure built during a time of growth and expansion in the city of Los Angeles. 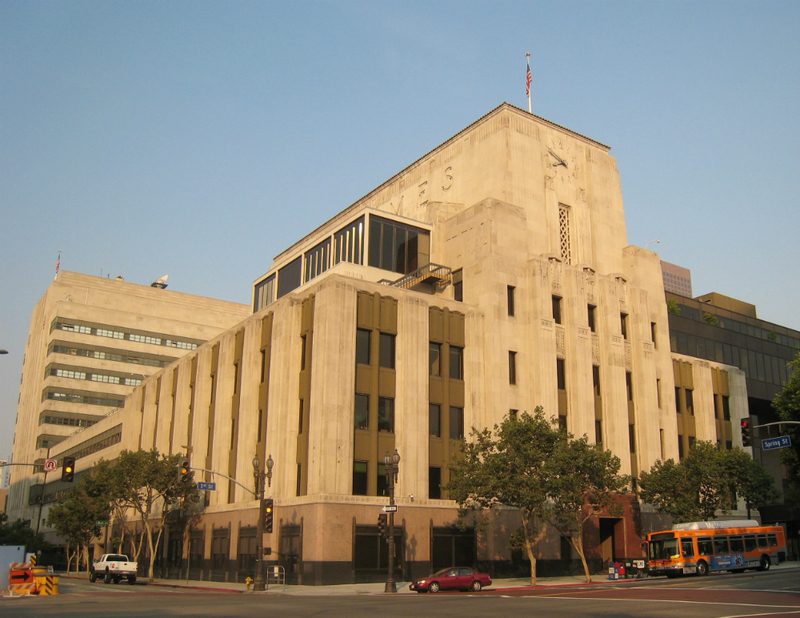 The council members on the PLUM committee disagreed, however, and instead voted to grant HCM status only to the older portions of the complex, including the flagship Art Deco LA Times building from the 1930s designed by Gordon Kaufman, and a later addition from the 1940s designed by Rowland Crawford. The decision will allow Onni’s project to move forward at a time of increasing change for the Civic Center, which recently saw the completion of SOM’s United States Courthouse, the Rios Clementi Hale Studios–designed Grand Park, and other notable projects. The district is undergoing a forward-looking master planning process that aims to convert the sleepy, single-use administrative enclave into a mixed-use neighborhood complete with apartment towers, office spaces, and new parks, including the forthcoming First and Broadway Park designed by OMA and Studio-MLA. Just around the corner from the proposed AC Martin project, Gehry Partners’s long-awaited Grand Avenue complex recently broke ground. 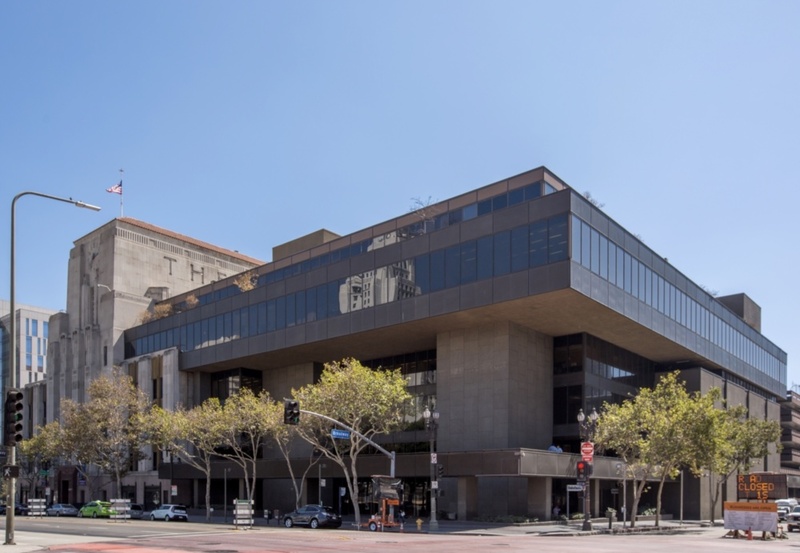 The battle over the future Times Mirror Square complex also comes following a bruising preservation battle aimed at saving the much-derided Parker Center complex, a former Los Angeles Police Department headquarters designed by Welton Beckett. Parker Center is currently being demolished. No word yet on whether an appeal will be filed in support of the Pereira structure or, if further efforts to save the complex fail, when demolition might commence. The nearly 400-page historic nomination can be found here. The effort to landmark the complex—years in the making—is somewhat coincidental in terms of its timing with the newspaper vacating its historic offices and comes after a particularly turbulent half-decade at the Times. Soon-Shiong announced his purchase of the newspaper in February of this year and unveiled plans to move the LA Times offices in April. Canadian developer Onni purchased the Times complex in 2016 from the previous Times owner, Tronc, and had proposed raising the rent for the facilities to over $1 million per month, prompting the relocation. The Times’s lease ran out June 30, 2018. Onni is currently pursuing a pair of redevelopment proposals that aim to demolish the Pereria-designed sections of the complex. The developer plans to replace those buildings with two mixed-use condominium towers designed by AC Martin. The towers, rising 37- and 53-stories, would bring 1,127 residential units and 34,572 square feet of commercial areas to the site. Gensler is also working on a blocky 32-story tower containing 107 condominium units, 534,000 square feet of commercial space, and 7,200 square feet of ground-floor commercial area that is slated to rise in what is now a parking lot across from the Times complex. The CHC will next conduct an on-site inspection of the LA Times complex in order to consider whether to advance the application for historic cultural status any further. The designation could impact the developer’s plans for the AC Martin-designed towers, but as the recent case with Gehry Partners’s designs for 8150 Sunset complex shows, landmarking a historic structure does not prevent its demolition. If the HCM nomination is successful, however, the developer’s plans could actually be bolstered by the availability of historic tax credits for renovating the complex if that is done in line with historic standards. A key question for the CHC committee will be how to qualify the historic nature of the Pereira-designed additions to the complex. The historic nomination explains that the Pereira additions are key to the significance of the entire complex and represent the apex of the newspaper’s development and relevance following L.A.’s post-World War II expansion. Pereira’s additions were designed to intentionally fade into the background so as to not detract from the iconic Kaufman-designed portions of the building, according to William L. Pereira, a monograph of the architect’s work compiled by James Steele. The resulting black granite panel-clad complex remains almost entirely intact and represents a key moment not only in Pereira’s career but in the development of L.A.’s architectural history, according to the report. The report says, “The building demonstrates not only Pereira’s role as a master architect who helped to shape the city we know today, but a building which is symbolically, urbanistically, and creatively part of the life of the city.” The entire complex is eligible for National Register of Historic Places and the California State Historic Monument list, though it is unlisted in both. The complex was included in the SurveyLA Los Angeles Historic Resources Survey and is listed in California Register of Historical Resources. The CHC will meet to tour the building at a yet-to-be-announced date and time. Until then, check out the nifty, illustrated explainer created by the Times that highlights the historic complex’s history and internal organization. 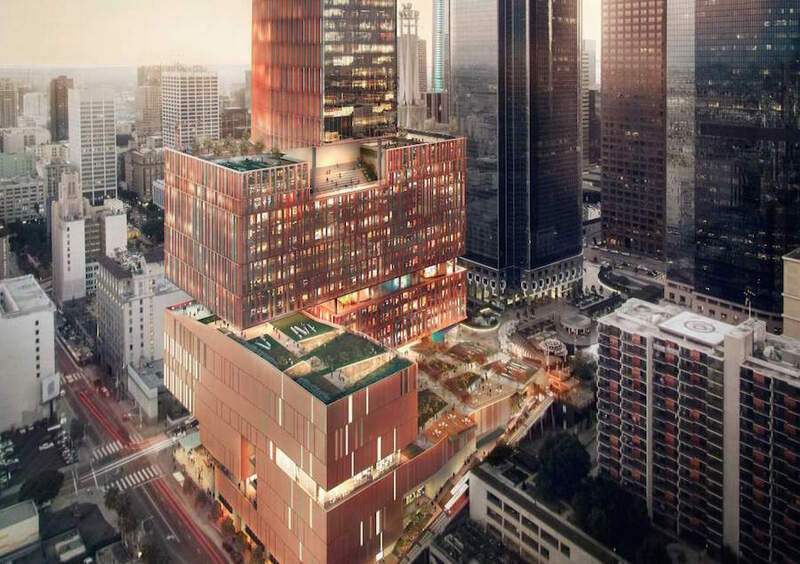 Vancouver, Canada—based developer Onni Group has officially filed documentation with the City of Los Angeles to redevelop the historic Los Angeles Times property in Downtown Los Angeles. Urbanize.LA reports that the developer plans to rehabilitate the most historic components of the site, including the original, Gordon B. Kaufman—designed structure from 1935 and a 1948 addition designed by Rowland Henry Crawford. Onni’s plans, however, also call for the demolition of the William Pereira—designed addition made to the complex in the 1970s. Through visually and formally striking and demonstrative of larger architectural trends from each respective era, none of the site's components, including the original Los Angeles Times building, the 1948 addition, or the High-Modernist Pereira addition, are currently protected by historic preservation ordinances at either the local or national level. The developer paid $120 million for the entire Times Mirror Square complex earlier this year and has been quick to announce the growing list of redevelopment plans associated with the purchase in the months since. Tribune Media Company, owner of the L.A. Times, announced an unrelated development a few weeks ago for a site currently being as a parking lot for the complex. That project consists of a 30-story tall, boxy tower designed by Gensler. The design of that tower features offset and cantilevered masses and would contain 107 condominium units, 534,000 square feet of commercial space, and 7,200 square feet of ground-floor retail area, all located above a new subway station being developed as part of the Downtown L.A. Regional Connector project. Onni Group's filing indicates plans to build a pair of new high-rise towers in place of the Pereira-designed structure. 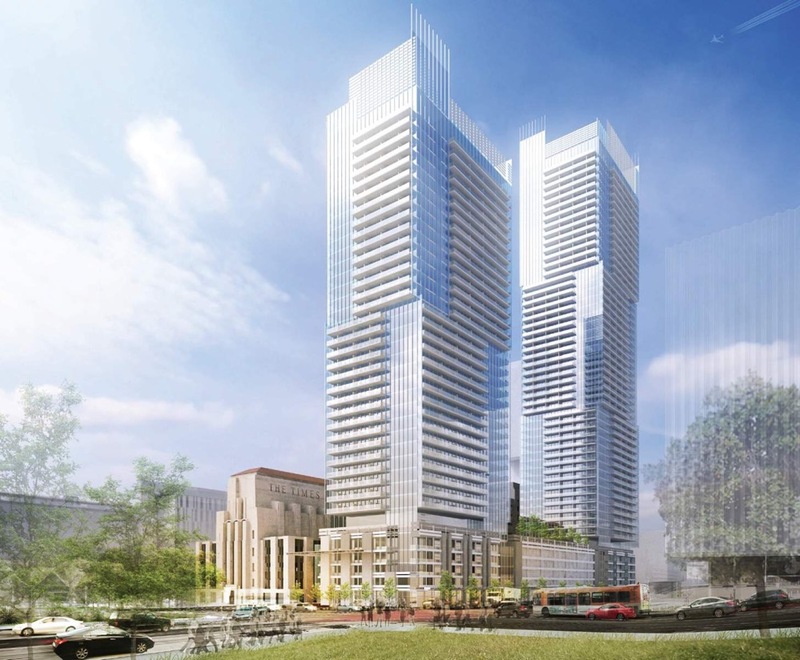 These towers would contain a combined 1,127 residential units and over 34,000 square feet of ground floor retail space, Urbanize reports. The developers would also rehabilitate the remaining L.A. Times buildings as office space. The proposed development would require a series of discretionary approvals by the City, but since the L.A. Times complex is not currently listed on the National Register of Historic Places or locally as a Historic-Cultural Monument, the Pereira-designed portions, in particular, are open to demolition. The filing comes as the development and preservation communities in Los Angeles spar with one another over which aspects of the city’s architectural history are worth preserving. A Gehry Partners—designed complex at 8150 Sunset that aims to demolish the Kurt Meyer—designed modernist bank has been at the center of this debate, as have proposals to demolish several other William Pereira—designed structures, including the Los Angeles County Museum of Art complex (to be replaced by a new $600-million museum by Peter Zumthor), and portions of the Metropolitan Water District.